Room for everyone in the charming Classic Craftsman! 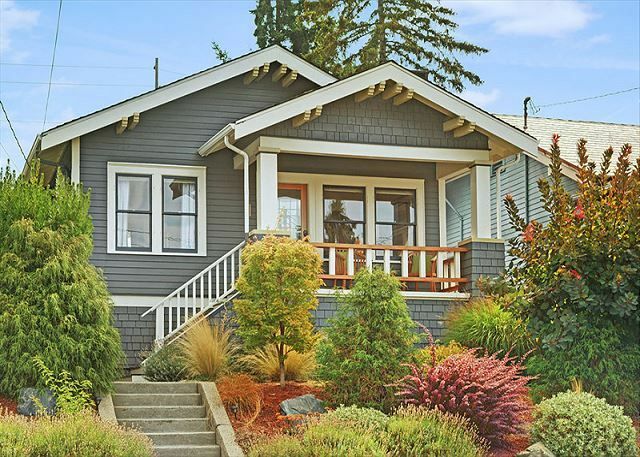 The Classic Craftsman is a Seattle home in the California Bungalow style bursting with charming character. Expertly decorated in a transitional style, this home has beautiful new furniture to make your stay comfortable and enjoyable! You will feel at home with hardwood floors and plenty of natural light in this immaculately decorated turn-of-the-century gem. The spacious 3 bedroom, 2 bathroom layout will accommodate up to 8 guests with ease. Discover unique construction and design touches everywhere you turn, as well as a fully remodeled kitchen with beautiful Shaker style cabinets and a subway tile backsplash. Custom built-in shelving is tucked into nearly every room as well. There is plenty of room to entertain inside and out with the large front deck, back patio, formal dining room, and comfortable TV room downstairs. Gather around the barbeque in the spacious and beautifully landscaped back yard with high-end patio furniture or watch the sun set over the Olympics on the front porch with a glass of wine. The Classic Craftsman is located in Lower Phinney between two vibrant Seattle neighborhoods; Phinney Ridge, which lies on the high point of the hill, and the wonderfully eclectic Ballard. Enjoy easy walking access to all kinds of restaurants, bars, shops and other hotspots right from your front door. Downtown Ballard is just a few minutes' away by car, and you will find some great restaurants to enjoy right on 65th and 70th NW, just down the hill from the Craftsman! Easily accessible to Greenlake, Phinney Ridge boutiques on Greenwood Ave, downtown Ballard, and the Woodland Park Zoo. In addition to local neighborhood flavor, it is easy to access Highway 99 and get to downtown Seattle and all the tourist sites there in about 15 minutes. There is no better home base for your Seattle stay than the beautiful Classic Craftsman! Traveling with a larger group? We currently offer three other rentals in beautiful Phinney Ridge: Phinney Suites Retreat (https://www.vrbo.com/1019504), Phinney Suites Apartment (https://www.vrbo.com/1019503) and Phinneywood Bungalow (https://www.vrbo.com/1019505). Contact us directly to find out more or book multiple rentals for a bigger party! This home is darling and in a neighborhood that’s easy to enjoy walking about or driving to events. We found the home clean and comfortable. We really enjoyed snuggling by the fireplace. The house is pretty well equipped - plenty of bedding, dishes, glassware. But we did miss a couple essentials like first morning coffee & a corkscrew :-/ We also discovered we had to schedule showering-some evening, some morning . Not enough hot water for a bath. But overall- this home is lovely-we’d recommend Classic Craftsman. We’d stay again. Thanks ! The house was in a perfect location and met our needs very well. We loved the arrangement of the house, with the two bedrooms and bath upstairs and the two sleeping areas and bath downstairs. The dining space was great for our meals. The air mattress on the sofa sleeper deflated considerably each night. It should be replaced. The sink in the upstairs bathroom had no stopper for the drain. I lived in fear of someone losing a valuable down the drain. In the downstairs bathroom, the door on the cabinet on the far wall was about to come off. We did not know what to do with our food trash. There was a guide for recycling, etc., on the kitchen counter and we knew where to put our recycling and our trash. But we didn't know what to do with the food trash. Because our son lives in Seattle we know the city has a system for picking up food trash, but we didn't have the bin to put it in. Each bedroom should have a trash can. The kitchen had deficiencies. We were 7 adults but the kitchen had only 2 wine glasses and 2 champagne glasses. Once we called, owner sent 4 more wine glasses, making a total of 6. The guy who delivered even thought that was weird and brought 4 more, so everyone could have a wine glass! We cooked several meals and were able to figure out how to make what was in the kitchen work for us. The knives were on the verge of not cutting! WE NEED TO LET THE OWNER KNOW WE BROKE ONE OF THE NEW STEMLESS WINE GLASSES. The house is lovely. Walking distance to stores and restaurants. Relaxing, quiet and comfortable stay on the border of Ballard and Phinney Ridge. We (my father, two daughters and I) spent a week here. The home is situated in a very quiet neighborhood but blocks from loads of restaurants and shops. We enjoyed our time and all felt safe, comfortable and relaxed while at home. The beds were comfortable. The place is clean & minimally decorated (which I like). The kitchen fully equipped. We hope to be back again. The reason we are giving 4 stars instead of 5 is b/c the kitchen needs more dishcloths, one of the beds was squeaky & the curtain on the basement floor between the living and storage space should be more secure. Thank you for sharing your home with us. Our two young families enjoyed this house over Labor Day weekend as our base camp for exploring Seattle. The Phinney Ridge neighborhood offered us what we needed (groceries, pizza, burgers, pastries, coffee) as long as we were up for a little hike (those hills!!). We were close enough to get into downtown Seattle by car service in 10-15 minutes, but could really relax on the back patio by the end of the day. The house itself is older (squeaky floors) but extremely clean. The kitchen was well-stocked, linens were soft and plentiful, cable tv had on-demand for our kids' favorite shows, and wifi when we needed it. We didn't end up using the bbq grill, but it was great to have the option available. We enjoyed the front porch for coffee in the morning, and back deck was a favorite spot later in the evening. We had a great time and definitely recommend it for young families or anyone looking for a cozy spot to stay just outside of downtown Seattle! Comfortable House in Great Location! This house is comfortable, clean and cosy. The kitchen is well stocked with utensils, the natural light is beautiful, beds are comfortable and it has an easy flow. It's near bus lines, fun restaurants and on a quiet street. We loved staying here!